OpenZaurus 3.5.4.1 is an alternate Linux distribution for the outdated and proprietary bundle of Qtopia that is shipped with the Sharp Zaurus. OpenZaurus is based on open-source code and enables the Zaurus to run most of the current non-proprietary and open-source Linux applications. It is based on newer versions of Qt/Embedded (Qtopia) and also supports X11. OZ also brings an up to date 2.6 kernel to the Zaurus world instead of the old 2.4.20 kernel that Sharp shipped with the C3x00 series. However, OZ comes in several differently packaged distributions or flavours. OZ/OPIE is the Qtopia based distribution wheras OZ/GPE is the X11 based distro. There is even an OZ/bootstrap with a bare minimum base system without GUI. In general, OZ is faster than the legacy Sharp ROM or its derivatives such as Cacko. However, OZ lacks an artistic touch. The default theme in GPE is rather ugly, in particular the icons are very plain and the font sizes are badly picked. The default OPIE theme on the other hand looks much more polished with nicer icons and crystal clear fonts. However, though the icons for the OPIE desktop are nice, the same can not be said for the applications. The tiny icons designed for the 200x320 screen resolution look very rugged and out of place in the otherwise good looking OPIE desktop. Hopefully someone with graphical skills will come up with a nicer set of icons for OZ. Featurewise, OZ has most of what Sharp ROM offers in terms of device support. Screen rotation, screen capture and resume/suspend works almost perfectly with only a few hickups. Softwarewise, OPIE has most of the software available on the Sharp ROM except for the proprietary software bundles. Unfortunately, those are quite important applications, in particular NetFront. GPE has most of the applications available for pdaXrom and PocketWorkstation, so a combo of OPIE+GPE can be comparable to a dual boot Cacko/pdaXrom or Cacko/PocketWorkstation type system. Hentges is another OZ based distribution which is tailored to be more user friendly and has the most commonly used applications pre-installed. Hentges is also pre-configured to allow you to have both OPIE and GPE running at the same time (not yet released) so you don't need to choose between the two and end up being limited to the applications the choosen flavour provides. Running OPIE and GPE at the same time allows you to use all of the applications available to OZ. The following section covers how to best use the available packages in OpenZaurus. It also shows how to run both OPIE and GPE applications together to get the best of both the Qt/Embedded and X11 world. Some of the customisations require additional files which should be downloaded first and placed on a SD or CF card for easy transfer to the Zaurus. 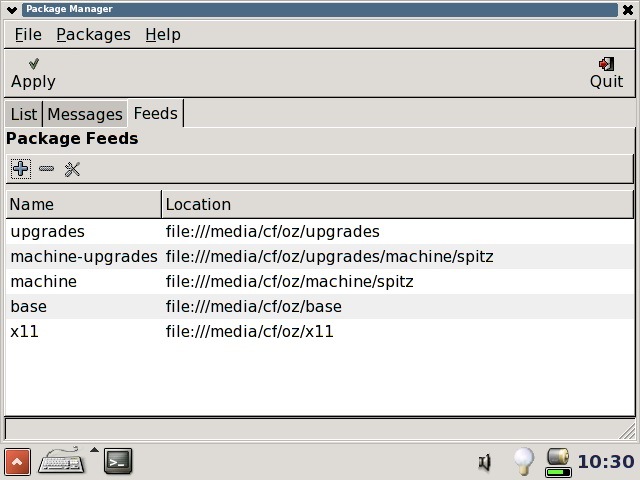 By default, the feeds are already configured to access the main feed server for installations. The Package Manager is either pre-configured for either OPIE or GPE, depending on which you installed, but if you want to run both concurrently, then you need to update the feed configuration to include all the feeds. You can also change the feeds to point to one of the alternate mirror sites, or if you have mirrored the feeds to a CF or SD card, then you can also change the feed to download from your local file source as well which is quite handy if you are offline a lot. The above sample shows a configuration with the OZ feeds mirrored to a CF card. You should add all the additional feeds as well for a bigger choice of available applications for installation. OZ 3.5.4.1 can use packages from both the 3.5.4 and 3.5.4.1 feeds. There are quite a few application packages in the 3.5.4 feeds but not in the 3.5.4.1 feeds. After changing the config files, you will need to run ipkg update to refresh the configuration and package db. You will also find that you will get more success when using the command line ipkg command to install packages rather than the GUI Package Manager. You can install both OPIE and GPE on different virtual terminals and switch between those two VTs to switch between OPIE and GPE. However, running both environments like this concurrently also uses up more resources. Alternatively, you can also pick one of the two environments to be your main environment and run the other in a shrink down version so you can just run the applications. Personally, I believe OPIE is more mature than GPE as a windowing environment for the Zaurus, and the configuration items in OPIE also appear to be more relevant for the Zaurus than they are in GPE. Thus it makes more sense to add GPE functionality to OPIE rather than the other way around. There are several essential customisations in order to get OZ working properly. You also need to modify locale.conf and change the timezone entry for OPIE. The default window manager in GPE is matchbox which runs all applications in maximised mode. In order to switch between several applications easily, it is a good idea to install the tasks applet and add it to the taskbar at the bottom of the screen. It is also a good idea to install the cards applet as well, so you get to control the SD and CF cards. OPIE is similar to the Sharp distro/Cacko and a lot of the customisations for those can also be applied to OPIE since it is also based on Qtopia but is a newer version (version 2.3 vs version 1.5) and open source. Unfortunately, the cardmon applet in OPIE is broken. It allows you to unmount the internal MicroDrive and does not show the SD card. To fix this, uninstall or disable the pcmcia applet and install the cardmon applet from the 3.5.4 feed instead of the 3.5.4.1 feed. You also need to install volumeapplet in order to be able to turn on/off keyboard clicks just like in Sharp/Cacko. OpenZaurus can also run some packages from other distros. This depends on the dependencies of those packages. For example, OPIE can run some of the Sharp/Cacko binaries because they are also based on Qt/E. OPIE is based on a newer version of Qt/E than Cacko and Sharp ROM and can run quite a few of those applications using compat libraries. However, some Sharp/Cacko applications depend on proprietary non-opensource libraries which cannot be run on OPIE. Opera for example can be run on OPIE. Some pdaXrom packages can also be run on GPE since both are based on X11 and GTK+. However, pdaXrom also has many applications that use other display widgets such as QT or fltk which GPE does not have by default. Also, pdaXrom packages before beta4 depend on a separate iconv library which is not part of glibc. Packages compiled after beta4 no longer have this dependency just like OZ packages and also use a similar kernel as well and thus should be even more compatible. Similarly, debian arm packages (PocketWorkstation) can also be installed on OZ. The .deb file can be easily converted to .ipk files. In fact, the OZ .ipk format is almost identical to the .deb format. The virtual USB network interface via the USB client cable does not currently work with Windows. It does however work with Linux. This is just standard ifconfig and route stuff once you have loaded the gadget module. You will need to load it manually after plugging in the USB cable. Don't expect it to be loaded automatically like in Sharp/Cacko or pdaXrom. Just plug the CF WiFi card in and provided it is supported, the appropriate drivers will be loaded for it and you can configure your network using the network applet. This is straightforward stuff if you know how to setup a network. Just plug the CF Bluetooth card in and provided it is supported, the appropriate drivers will be loaded for it and you can setup PAN or GPRS with the applet. Make sure you don't forget to set your PIN. Using a USB Ethernet adaptor you can connect to an ethernet network. Usually, those adaptors use a rtl8150 or pegasus chip so installing the appropriate kernel module will enable the adaptor as eth0 once plugged in. The rest is standard ifconfig and route stuff. You can share the files on your Zaurus via Samba. Just install the samba packages and configure smb.conf. Furthermore, you can also get a remote terminal into the Zaurus via ssh and transfer files via scp. OZ by default uses dropbear instead of the more common sshd. Configuring VNC allows you to remotely control other machines or allow other machines control your Zaurus. You can plug in external USB keyboard and USB mouse if you have a USB host cable. Using a USB hub, you can have multiple USB devices connected concurrently. The USB keyboard should be correctly mapped and just work. The USB mouse might be a bit more problematic since it might fight for control with the stylus. Backups are always important for recovery in case something goes wrong or accidental deletions. However, doing a NAND backup on any of the C3x00 series models in OZ 3.5.4.1 is useless since it does not even use the NAND flash area. The backup application provided by OZ only backs up the PIM data which is a good thing but not sufficient. A gzipped tarball of everything seems to be the only solution at the moment. OZ is able to facilitate booting of different media through the use of altboot. With the addition of kexec to altboot, it is even able to boot another kernel. Using these features you can boot different versions of OZ or even other distros from SD or CF cards. Altboot allows you to boot straight off an ext2 filesystem from a physical media such as an inserted CF or SD card, or mount an ext2 loop back filesystem from either CF or SD card as well. I have enhanced the altboot config and menu to also allow you to boot off ext2 loop back images from the internal MicroDrive located on /hdd3 partition. In order to do that, place the loop back images under /media/hdd/boot-images and add 30-bootHDD to /etc/altboot-menu and update altboot.conf and altboot.func. If you want to disable the altboot menu from being shown several times, then disable altboot on the ext2 loop image. This prevents altboot to be run a second time during bootup once you have selected which image to boot. A native on-board gcc compiler can be used to develop and compile applications directly on the Zaurus. Although this is not as fast as developing on a PC, it is quite useful when you are using your Zaurus as a laptop replacement and want to build your own apps without access to a PC running Linux. With this mimimal set of packages, I can compile simple C/C++ programs. I have build a cramfs image (zgcc-344.cramfs) which includes many more development packages and tools for easy compilation of X11 applications similar to what the pdaXrom zgcc image offers. See packages.txt for a list of packages included in this cramfs image. In addition to installing the packages, I also had to add a few symbolic links as well as apply some changes in the directory structure as well as some configuration changes. All the required changes have been captured in mkzgcc.sh. To use the cramfs image, mount it under /mnt/zgcc and run the zgcc-setup script to create the necessary links. Finally, source zgcc-env and you are ready to compile. Then run the following command which will generate an executable called hello. Then run the following command which will generate an executable called hello++. A java compatible environment exists on the Zaurus via the use of jamvm and classpath as an alternate JVM and jikes as a compiler. DISCLAIMER: The information contained on this site is provided AS IS. No assurance is given to the accuracy of the information or instructions provided. You may use this as a guide but do not blame me if anything bad happens to your system or your data. Use anything described on this site at your own risk. I shall not be made responsible for anything you do.